Picking greens throughout the winter is thrilling, especially since I grew up in eastern Washington, where the only activity that resembled winter gardening was trudging outside in my boots and down jacket to dig carrots from beneath mounds of snow-covered maple leaves. There's nothing quite like the satisfaction of eating a cold, crisp carrot mid-winter, but imagine my surprise at being able to garden year around in a maritime climate. Even with the winter freezes, kale and chard are cold tolerant and sweeter after a light frost. Here in the Pacific NW, you can eat fresh vegetables from the garden all winter long. Many seed companies sell a variety of kales and chards. Why not try the Wild Garden Kales, a mix of Siberian kales in an array of color: light green, purple, blue-green, and red. 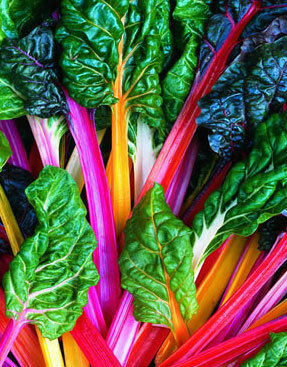 Or 'Bright Lights', chard with its giant, burgundy-tinted green leaves atop red, yellow, orange, or white stems. Not only are these vegetables a treat to eat, they are also a beautiful addition to both the ornamental and vegetable garden. And what a healthy way to brighten up any garden, growing colorful exotic leaves that are higher in calcium than dairy products! After you've picked and eaten greens during late summer and throughout the winter, let the plants grow until it's time to cultivate the following spring. After mine go to seed, I delight in the garden patch come March: five to six-foot kale stocks studded with vibrant yellow flowers, swaying in the breeze, a lovely contrast against a patch of yellow-green budding brush beyond. And the colorful stems of chard, twisted and thickly ribbed stocks reaching upward, readily forming tassels of buff, peppercorn-size seed. If you wait for the kale pods to form, you'll have an abundance of tiny black seed, enough to sow every neighborhood garden, as well as start your following year's crop. Plus, tiny birds love to forage in your vegetable patch. What could be better? If letting plants go to seed isn't your cup of tea, then compost them after your last harvest and try a new variety, say Winterbor kale with its tightly curled, blue-green leaves, or Winter Red. 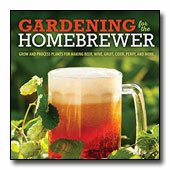 Or go ahead and plant Golden, Rhubarb, or the traditional Swiss Chard with anticipation of a colorful crop. The best part of sauntering out to the garden midwinter is you get to carry a basket of greens back to the kitchen, and perhaps a few potatoes missed during fall harvest, to chop and toss into a pot of savory lentil soup. Both kale and chard have earthy flavors and make great additions to stir-fry and winter soups. I like stirring a bunch of chopped, fresh kale leaves in olive oil, adding a sprinkling of cinnamon, ¼ cup of raisins, and simmering for a few minutes. Before I serve this excellent side dish, I add a splash of tamari to adjust the seasoning. Amazingly, these vegetables also adapt well to the flower garden. Brilliant red and yellow stems contrast nicely with lime green grass or low-growing, blue-green evergreens. The leaves are substantial; the ribs are brightly colored. They can be planted as ornamentals wherever you need a splash of winter color. And the plants are easy to grow; in fact, they're considered weeds in some parts of the country. But ignore their legacy and let them go to seed; they'll come up by the thousands, but not all over the yard like forget-me-nots, only where the seed falls beneath the plants. When the seedlings are a couple of inches tall or so, thin them and use the tiny leaves in a stir fry or as a plate of wild greens, add some tender dandelion leaves and you'll have a wonderful spring tonic to serve with salt and pepper, vinegar and oil. If you don't let your plants go to seed, use the seed you saved in a cold, dry place from the year before or order new packets online and broadcast plant in late April or May. After you eat a few batches of baby greens, transplant the rest for summer, fall, and winter crops. They transplant well, no worries. If you plant by row, plant the seed ½ to 1 inch deep, 2 to 3 inches apart, and in 24” rows. Thin the plants to eighteen inches, always giving them plenty of room to grow lushly and stay healthy. If you've cultivated the ground, and amended it with fine compost and organic steer manure, these plants will rarely have any insect problems. If you do get an infestation of aphids, just pull the plant or remove the infested leaves and destroy them. Then enjoy the greens, picking from the growing plants during late summer and throughout the cool, rainy winter months, recharging your body with their hearty nutritional value and your spirits with their leafy displays of color. Photo courtesy of All American Selections.